Looking at the light curve, I'm pretty proud of the visual observers. Your observations are mostly fitting into a peak-peak distribution of about 0.5mag, meaning the RMS uncertainty is in the 0.1-0.2mag range. Not bad! I am NOT so pleased about the digital observers. Your observations are also mostly fitting into a peak-peak distribution of 0.5mag. Your distribution should be at most 0.05mag, or a factor of ten better. It is not equipment, as Ulisse Munari's ANS consortium in Italy can achieve 0.012mag total uncertainty between multiple observers, using amateur telescopes and CCDs. I think the difference is in technique. AAVSO observers are not transforming their data, are not observing with proper cadence and multiple image sets, are not watching for saturation or other defects in their images. The professionals are NOT observing this nova - yet. It is still too bright for even a one-meter telescope; Swift is totally saturated with its imager, etc. It is up to us to create a quality light curve, one that shows all of the low-level bumps and wiggles. It is not just this nova, but any improvement we make here will also make subsequent novae observations better, and give better results for Jeno's project. So what I am willing to do is work with each individual observer, but in the public forum. Let's examine images, consider how to obtain and use transformation coefficients, and learn techniques to improve the photometry and the reported uncertainties. It is an investment of my time and that of other photometrists that should reap rewards - if you are willing to suffer a small amount of public scrutiny of your data. Those who are AAVSO members can share their images through VPHOT; others can upload requested images to our ftp site where we can link to them for examples. There are a couple of dozen digital observers of Nova Del 2013. Are you willing to help out? How do I share with everybody? Vphot asks for the "user names(s) of those you want to share with". I took two series of images on Aug 30 (Aug 31 UTC), 20 x 1s. The sky conditions didn't seem to be as clear as they were during my former observations, declining as the evening progressed. I took some more series at 5s (16x) and 8s (10x). The peak values for the nova appeared to be below the saturation values (<45k for my SBIG ST-8X) for all images. Please let me know how to share with "everybody", if necessary. For now I shared with Arne only. Vphot reports that I reported the measurements to AAVSO (i.e. I do have created the reports), but I have not uploaded them, yet. To the extent that it helps to hear this from someone with a PhD (= Piled Higher and Deeper). I am eager to see this. If I had CCD images of Nova Del, I would personally be taking Arne up on this offer without hesitation. I'm certain what I'd gain would outweigh any temporary embarrassment. Its a golden opportunity to learn. I will be grateful to anyone who volunteers. And Arne, if the offer extends to PEPV, I'd be happy to share and be an example for that. I don't want a thousand images from each observer. What I will do is examine the light curve for each observer, and pick a few images that are representative and ask for those. For sharing via VPHOT, start by sharing them with me (HQA). If you only have a handful of images, then go ahead and share them now and let me know. and again, let me know when the images are available. I shared some images with you. Not really enough for a light curve since it's only three days and six reported magnitudes, but it indicates how image times impact saturation and what I decided to report. I tried to upload 3 images from 3 nights to the ftp site, but got the "550 Permission denied" error message. Googled and seems like some permission needs to be set on the AAVSO end. Anyone know if I need to do something? I'll bite first but perhaps not in the way you want? I have only collected three sets of data in B and V for this Nova. My first issue was the need to sample with two second images. Anything more and I was up near saturation for my 6303 ccd on my 12.5 inch scope (too big!). At this short integration I suspected scintillation may be a problem so I took 5 images in each filter and stacked them to yield one reported magnitude. I used VPhot ensemble but only two comps were in the field due to the short exposure. In fact, one was a comp and the other the check. I could have transformed and can still do that but is the nova particularly colored and will transform make a significant difference compared to non-transformed error? I can share my limited images but that is a summary of what I did. I propose that your main issues can be addressed by someone directing a focused campaign with specific recommendations on what to do. I suspect Munari's consortium defines issues of cadence, number of stacked images, and comp selection for each target. I think it is the only/best way to obtain tight magnitude measurements among several observers. I do not think I have seen such a detailed campaign protocol? CBA generally gives such guidance. Are time series desired? If so, over what period? What would be a reasonable expectation for short term variations? Clearly, the proposed image cadence will impact what short-term variations can be observed, if they exist. SNR is not a problem at this time in the slow decline. What comps should be used? Use all comps VPhot provides or a subset? You mentioned all of these issues in your message. I think they only need some corresponding approximate recommendations based on your experience? Note I used the word approximate not exact. Each observer should learn how to translate such recommendations into the best protocol for their equipment. I have described what I did. I do suspect saturation has been the primary cause of the large error and you are right, that is something that all CCD observers should know and prevent! My suspicion is that the brightness of this target has caused the observed problems that may not appear for other fainter targets. From specs I had thought my camera didn't saturate until about 65000 ADU, but the first night imaging Nova Del a value of 7.1V was found. I knew from visual observation and AAVSO measurements that couldn't be right. Turns out it was saturating around 48000 ADU. Since then I've been taking exposures to keep it well under that. Reread my manuals and will do some testing to get the gain and saturation better pinned down. From what I understand of transformations, a series of images must be run with different filters. All I have is a Johnson V. Would like to have B and R filters, but cost is prohibative right now. One other problem for Nova Del I'm having is that only one of the comparison stars from the AAVSO chart will fit in my FOV at f/6.3 (13'x17', 0.76"/px, ) on my C-11. I have a setup to make it f/5 (16'x22', 0.96"/px) which would increase the field size, but am unable to attach a filter. I can go out to f/3.3 (25'x34', 1.65"/px) and use the filter, but with prior experience the undersampling was giving results not accurate enough for reporting. Going slightly out of focus helps, but how does one determined the optimum amount of going out of focus? I just shared 4 images named "User defined object #1". They are B,V,R,I images taken with a 4" refractor and a STT-3200 camera. I defocused -10 steps and adjusted the exposure to place the brightest star (Nova Del 2013) of the frame to around 32000 ADU. I took three images in each filter adjusting the exposure for each. The images were calibrated and uploaded to VPHOT where each filter was stacked. Then groups of B-V, V-I, V-R were transformed using an aperture of 1.5 FWHM. V 9.044 (9.059). The error was B=0.042 and V=0.086. Thanks for offering to help us with this star. Any comments are appreciated. I just uploaded three images from 28-8/29-8/30-8 to the ftp. They are called 2808.fts, 2908.fts and 3008.fts. The images were taken with a Baader V-filter and QSI583 on a TEC-140. Every image is a stack of 5 images of 4s exposure. I just shared all my images that I used for the AAVSO reports I submitted for the nova up to now (whenever the weather was good to reasonable, which was not so easy lately here in the NE of USA). All of them are stacked series; the first ones on 8-17-2013 to 8-21-13 were stacked with Vphot, the others were stacked in AIP4Win. I had played with defocussing in the beginning, but then Vphot was not able to plate-solve anymore (currently my fits headers do not have complete WCS data, so I need to plate-solve in post-processing). I then switched to "astrometry.net", uploaded my stacked images (plate solving ALWAYS worked) and - from there - downloaded the fits images including the completed WCS data. Those images I uploaded then to Vphot for further processing. I.e. the latter images do not appear as stacked in Vphot, but they are (I tried to place the stacking info into the comments). On the last day (UTC 8-31-2013) the sky conditions were not really good - kind of hazy, so I played with different integration times (1s, 5s and 8s without apparent saturation even at 8s...). By the way, I am using an LX-200 8" classic, a f/6.3 reducer and a SBIG ST-8 camera. One thing I just noticed: During stacking Vphot is creating the correct time info regarding the stacked images (i.e. the time "in the middle" of the stack), wheras AIP4Win has used the first image's time in it's "multi-image" "deep sky" tool for stacking. The "Multi Measurement Tool" for photometry on multiple single images does it correctly, though, if I remember correctly (I will contact the authors of AIP4Win for possible improvements). The incorrect time info that some of my reports thus display make me crinch a little (but they are only off by minutes at the maximum, for this slow target it might not matter). Please let me know if you want me to edit and correct those...! Otherwise I would like to thank you, Arne, for your generous (i.e. time-consuming on your side...) offer to look at our data! This is a real opportunity, I agree, and we all can only learn from the "scrutinization" (is that an English word?). I can see some of the CCD issues. For variable observing a lot of CCD observers will have 0.5 deg FOV or less. I have decided not to add this to my current list of VS due to not having any reliable reference stars in my 38minute FOV. As you have said, poor data is only going to reduce the accuracy of those able to submit more accurate results. On chart 12635LM I can only see 98 and 80. I would not use 80 because of the inaccuracy of the cluster. 98 might be ok but only one ref is not any use to automated systems. I like to have 3 or 4 reference stars and initially to look at how reliable they are likely to be in terms of dim background stars in the Signal Gap Background. A spread of reference stars over the range of the variable is also a useful indication of accuracy. Arne, I agree to be scrutinized. I will upload some images to ftp site as soon as I can. I did not make photometry by Vphot because defocused images to reduce counts, and the software was not able to analyze the frames. I proceed doing differential photometry in a differential phot. tool (Fotodif) in 5 or more images, using 80 comparison star, and calculate the average value. I do this for BVR and I. It's always good to get feedback. I just uploaded a zip file with a night's run, AIP output and the Excel spreadsheet I use. I've been struggling to get a sense of how good my nova photometry is, so this is a welcome opportunity. I've just uploaded a zip file with my images of 2013 aug 25 session. I was only able to take measurements on 4 nights so far (clouds & vacation), but if DSLR photometry is part of this effort I'm willing to contribute what I have so far (I guess calibrated FITS files would be better to share than raw DSLR files). I think this is a great idea to improve the quality of the observations. Thanks to everyone for submitting images. As an initial step, I thought I would go through the V-band observations submitted on JD 2456535. VOL submitted two data points at 0.2910, 0.2938 with mean value 6.58 with reasonable uncertainty. PAI had one point at 0.294225 (0.1sec time resolution, unphysical) at 6.68 with 0.04mag error. TFM had one point at 0.31760 at 6.80 with 0.02mag error. ATE did a brief time series; 27 data points between 0.32149 and 0.32790, typical 20sec spacing, with mean value around 6.90 with typical error 0.01mag, ensemble. HAGA did a brief time series; 18 data points between 0.329213 and 0.35282, typical 2min spacing, with mean value around 6.75 and typical error 0.01mag, ensemble. CLZ reports 5 measures between 0.360336 and 0.365671. Three of these points are around 6.73 with 0.001error; two are 5.63 with 0.002error. Obviously, something is wrong. AHM has three measures from 0.52194-0.52770, with mean 6.87 and error 0.01mag, reasonable. OAR reports a BV pair, 0.73691, 6.814, 0.003, defocused. CLZ with two 5.63 measures. Are these a different filter? I'd like to see all 5 images. KSQ at 7.21 - this is 0.5mag too faint. Why? Let's look at the image. this is a 5-second exposure with iT5, an 8-inch telescope. My bet is saturation. AHM is at 6.87, which is 0.13mag too faint. Why? Let's see all three images. These are 5-8sec exposures, which are too long for most telescopes. What is the instrumentation (camera, telescope aperture)? ATE is at 6.90, with is 0.16mag too faint. Why? An image or two might help understand. TFM is faint for this interval, by about 0.08mag. It might be useful to see that image too. Much of the remaining error is most likely transformation differences; we might do some tests and see whether transformation improves or worsens the agreement. So my first comment is that we are still likely having saturation errors; plus, observers are NOT looking at their images nor submitted data. Actually I had already tried to explain the "history" of these reports in this thread on Aug.31, 6:15PM, hgeagle is my username. I am using a LX-200 classic, 8" with f/6.3 reducer and a ST-8 camera. Here is/was my thought process: Typically I was using 1s as exposure time, but - on the day discussed here - the sky conditions were not very clear, kind of hazy and getting worse as the evening progressed (really not ideal conditions, but due to the small field of view and differential photometry I thought I should at least try...). At 1s (I have a series of those images, too) I got as a peak value for the nova about 5000 counts. I.e. I should have been able to integrate about 8x longer w/o danger of saturation. Not true, I actually looked at every single image and submitted data . And, if the 8s images were saturated, the brightness values of the nova should appear to be smaller (i.e. mag values larger). However, it looks the other way around... I get the impression that there is another reason (not necessarily saturation): e.g. light-leaks... affecting dark frames? The histograms for 1s and 8s images look different in shape,too. Of course I like to be corrected. Another possibility would be: short time fluctuations of the nova (unlikely, I think, on these time scales). In the meantime I uploaded all 10 single 8s images and a Vphot-stack to Vphot, all are shared with you, Arne. And again, thank you very much for taking the time and making the effort!!! I am sorry I have not reported my observations yet. I have a coverage of near all nights since the 15th (more than 100 points) but I have a serious concern I would like to resolve before reporting: how to deal with such spectrum far from any continuum ? I observe with a Canon 450D and a telephoto lens ( 200 mm F4) It results in a very good SNR without saturation (automatically checked by my software) The observation points are the average of 5 images exposed 20 to 30 sec each at ISO 100 and a defocus set to avoid blending and saturation. A large ensemble is used as reference. Points are taken every half hour when possible. The V mag is generated through my VSF technique (my JAAVSO last year paper). The SD of each series of 5 is generally well below 0.01 (often much lower) essentially due to the sky condition. The sky was exceptionally stable the first days, then we had to shoot between clouds for several days and last was a very clear sky but a lot of scintillation. My issue is about the H alpha line. It's a lot of the total energy and it evolved a lot since the beginning (to see the ARAS site and François message). This Halpha line falls onto the red roll-off of the V filter Bessell definition. Then there are number of V response curve definitions (!) and the commercial filters are far to follow any of them at roll-off level. Then there is the impact of the sensor response. I think this is a clear reason of shift between observers and even a shape change of the V light curve due the high Halpha variability. The "a" red coefficient of my VSF has normally a small impact to the V result, with the nova it becomes critical ! This is the reason why I want to review its calibration before getting further. Anyhow it shows how much the issue is critical ! Then I wonder how a classical transformation could work. The red V contribution of the Halpha has no relationship with B-V. B-V is unuseful to such transformation. What do you think about that ? What recommendation ? Since its pretty much conceded that observation cadence faster than 20 seconds just measures scintillation, and on bright objects, our cadences are faster than this, even when defocussing, should we implement a front end on WebObs that would average data subitted at a faster cadence from a single observer? This would also adjust the observation totals accordingly. I know that Maxim has no easy way to do this--and apparently the same is true for VPHOT. It takes a spreadsheet manipulation, and folks are obviously not doing that. This would address both the scintilation and the observation padding that results. This would tend to level the paying field for all. Are there any recommendations for DSLR observations of Nova Del 2013? Specifically, I am unsure of which comps to use and what B-V value to use for the nova itself when calibrating. Pardon my comment, but I think you should make some of your own recommendations and see if others agree. You have been a member for a few years and have taken a couple of appropriate Choice Courses. I believe you know the answers? Where can you get information on the current B and V magnitudes for the Nova, so you can calculate/approximate the B-V color? What criteria influence your choice of comps for ccd observations? The main difference between dslr and ccd is FOV size, which has some impact on extinction and secondary color effects. So again, I hope you will give this a try before someone just gives you their opinion and answers your question. There are number of stars near the nova that have a comparable mag level within ~6 degrees, I use HD194577, 195479, 194841, 194616, 195217... and others in a large comp ensemble. I get a V mag very coherent with the XHIP catalog for the stars of the "ensemble" and they look stable. B-V ? hmmm, as I said hereabove it's not an obvious question, in particular for DSLR. The transformation concept based on B-V supposes that the spectrum continuum of the stars is somewhat "normal" let say monotonous. Here it's far to be the case ! Now the Halpha line is very strong and dominant. Have a look at the ARAS site. While I am continuing to look at data, the star itself continues to fade. My concern is that several datasets seem to indicate that some variability on a sub-day time scale is occuring. What I'd like to know is whether this is real; the variability is not due to merging of diverse datasets. So keep observing; if you can do time series, consider spending some time looking at the nova. Time series gives us overlap between observers, which helps enormously in figuring out differences. We don't have many cases of bright novae, and this one is still 7th magnitude! Ran 2 hour time series in V last night. Binned images by 5 to smooth scintillation noise. Fainter comp variability SD=0.007 in VPhot. Nova declined about 0.06 over run. Curve quite tight (SD=0.01) for first hour but exhibited more fluctuation during second hour. Comp was level and smooth for entire run. 570 images (2 sec) but I reported binned x5 values for reporting (115). Do you want images? I looked at your time series. It dovetails with AHM's time series quite nicely, with an offset that I could believe is due to non-transformation. I don't want images from you yet; let's get the "low hanging fruit" first. Thanks for binning - that reduces the scatter. While there is evidence of variation over several minutes, the few-second cadence of your dataset is probably overkill, and you might consider averaging 10 images instead of 5 for your scintillation reduction. I wonder why your noise increases at the end. The airmass is still low, and the star has not faded so much that you should have increased Poisson noise. What type of telescope are you using? Is this is a case of GEM flip? Always west of meridian, so no meridian flip although I do have a GEM/Hyperion (12.5" f/8 Cassegrain with corrector lens at back end). Airmass from 1.1 to 1.45. ADU Max does decline from 25K to 20K during that time due to extinction. That may answer the increased noise since it is not enormous? The 98 comp does look tighter but with careful looks that may not be exactly true? Would need a math calc to really tell? VPhot statistics seems to say fainter comp is tighter? That would imply Nova fluctuation may be real? Yes I saw AHMs data overlap and smiled. Yes, I also suspect the difference may be due to non-transform since it is about the right magnitude difference (0.02?). Looking at CCD light curve for last few days, it appears that each day earlier observers before 00 UT see the Nova about 0.4 mag brighter than other observers after 00 UT. Curve declines during night. Looks real, certainly repeating daily? Same observers? Different continents? After discussion, hard to believe it is observer bias of that magnitude difference?? Thoughts? I did DSLR measurements from ca 20:00 UT to 22:30 UT on Sept 4th, one exposure every 30 seconds. I'm not quite decided yet how best to combine them into individual measurements , I guess I will stack batches of 10 , so one measurement every 5 minutes. @Roger: Is there a way to make an estimation of the worst case effect of V filter differences with respect to Halpha transmission? Like multiplying a model spectrum of the nova as it is currently with some extreme transmission curves of V-ish filters? Just so we know whether this could account for, say 0.1 mag or 0.01 mag only in differences. Yes, I am looking at it, I would compare between a V definition like Bessell and a DSLR G or even put a strong cut about 640 nm using the simulation from my last year paper. My first problem is to decode the fit spectra from ARAS ! Their format doesn't work with my fit reader, I wonder what computer data order they used, big endian, little endian, signed or not, it doesn't work as usual, I got a mix of bytes in a strange order as the data, the header is ok.
Befor this what I can say is the difference between a set of normal coefficients of my VSF and another that has no extra red contribution is about 0.06 mag. For three days I see the nova mag nearly flat. Today 7.216 7.220 7.234 7.229 Each is series of 5 images, 30 sec each, every half hour starting at 19:45 UT. 450D, 200mm F4 on equatorial, you know. Series SDM is about 0.005 . There is a significant variability, on short term (image to image) , order of minutes, on the red channel (H alpha...). The G and B are stable like other stars within a series. Their format doesn't work with my fit reader, I wonder what computer data order they used, big endian, little endian, signed or not, it doesn't work as usual, I got a mix of bytes in a strange order as the data, the header is ok. This is what the nova spectrum looked like in the V passband on 14th August and currently (This only includes the filter passband shape, not the response of the camera and other optics which would vary between observers and for this exercise is assumed flat). Note the large H alpha contribution currently despite it being at the extreme edge of the filter response. Sorry Robin, but Vspec, ISIS and others are not useful to me. I need to use the data in my own software. The problem comes from the fact ARAS has choosen to use the 32 bits flotting point option that remains a possible choice within the many FIT standard options. This old format is not available in present computer library I use (present is 64 bits...), I had to write a specific utility to read it, done now. The problem comes from the fact ARAS has choosen to use the 32 bits flotting point option that remains a possible choice within the many FIT standard options. Just to clarify, this aspect of the format is not specifically dictated by ARAS. Spectra are accepted to the database, reduced using whatever software the observer prefers, provided the result conforms to the fits standard and reduced in line with the standards defined for the BeSS pro-am database. There are spectra there reduced with various software but it is probably true that the majority of observers are currently using ISIS software for data reduction. I have not been active looking at the forum so missed this earler. I have shared 3 images from 18/8 as examples. 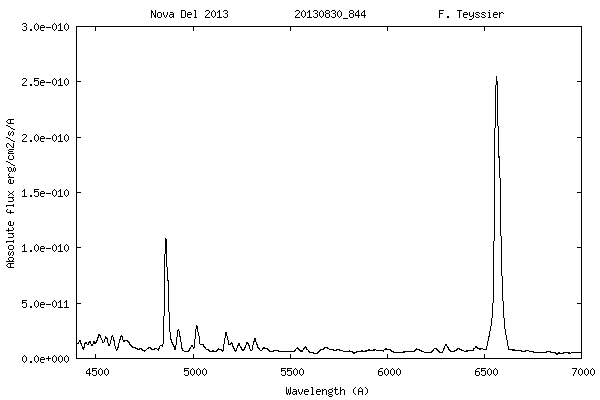 I have been taking some photometry but have been mostly concentrating on spectroscopy of the nova. My photometry is simultaneous to the spectra through parallel scopes to help with calibration of the spectra. They are big files and I have trouble uploading big files to VPhot. The uploader seems to crash regularly when only partly uploaded so I haven't tried to upload any more. These early files needed to be short exposures to prevent saturation. The V file is a 2 sec exp and the B are 5 sec. More recent images are now using 20sec for V so there is less variation between exposures. I use the 80 star as the comp star and the 98 as a check. They are the only comp stars in the field. If I reverse them there is a 0.1 mag difference between measurements. This seems large. My images are well flat fielded and other targets with comp stars across the entire frame do not show such variation. I wonder about the accuracy of the comp star figures and if this is contributing to the spread of the results that have been uploaded to the database. Hopefully we can improve the accuracy between contributors of CCD data. I haven't been able to find the 3 images that you indicate that you have shared. Can you give me some more guidance as to where they are and what they are named? Thanks! I have shared 17 images from various days all now labelled NovaDel2013_BHQ and shared to HQA. I have looked more closely at the early short exposures. I think the main problem is low S/N for the check star. The comp star 80 still has a reasonable S/N so should be OK. My 3 images results need averaging to improve the accuracy. The later ones now have 20 or 30 sec exposures and the S/N for the comp and check stars is much better giving errors ov ~0.03 which seems quite accetable. I can certainly transform the results but I don't think this would make that much difference. My transform values are very close to 0 or 1 so make little difference to the magnitude. Terry was nice enough to share these images with me on VPHOT. Looking at them, with the default settings of VPHOT's photometry tool, I get the results mentioned by Terry - a big difference between using the 80 and the 98 stars (0.1mag). Terry is using a Vixen VC200L 8" cat telescope, along with an ST-10XME camera. The pixel scale for this setup is about 0.78arcsec/pix. On his images, the fwhm is about 6-7 pixels, for a seeing of about 5arcsec. I can believe this, as he is in the southern hemisphere and looking through a lot of air to see V339 Del. The images look nice. Because of the seeing, the star profile is spread over lots of pixels, so he can use a long exposure - this is good, as it lessens the effect of scintillation. He is combining sets of images, further improving the signal/noise. So why the difference in target magnitude, whether he uses the 80 or the 98 comp star? The answer in this case is that he is using the default settings of VPHOT, which specify an aperture radius of 4 pixels, if I remember correctly (once you change these, I don't see any obvious way to return to the "factory" settings). Anyway, that aperture is way too small for a 7pix fwhm star. My rule of thumb is that you should use apertures in the 5fwhm diameter range for bright stars. In this case, if you adjust the aperture to 14 pixels radius, and the sky annulus to start at 20 pixels and with size 10 pixels, you will find that the two comp stars now give very similar results. So in this case, you need to be careful to select the right aperture size for your equipment and seeing. So Terry - nice images! Redo your photometry with larger apertures and update your submitted values. Sara Beck was kind enough to install Zap on my computer, making it much easier to identify discrepant points and look at the details of the observation. So here are some recent points for which I'd like more information. 2456542.3257 NRNA at V=7.18 (a set of ~8 or so observations). If you are running a long time series, then reporting a high-speed cadence, where each submitted observation has good signal/noise, can be ok. Reporting just a tight little cluster of observations serves no purpose. Average these values together and report mean and standard deviation (which is higher than the reported uncertainty, BTW). 2456542.39167 SJAR at V=7.31 (a set of ~4 observations). Same comment as for NRNA. Taking multiple exposures is great, as it gives you a really good handle on the uncertainty. Reporting each separate exposure is not the right thing to do. 2456542.40557 ELTA at V=7.36, same comment. This observer reports small groupings on multiple nights, such as 2456541.34583. Please average these values. Note, however, that these 3 datasets are fading, and you could connect a smooth curve with the two longer time series on this night, IF you believed each observer and understood their systematics. Unfortunately, none of these observers overlaps with another, and none observe long enough to see a general trend in their data. We need more observers! A clue is to look at previous nights, and there we see that NRNA is always 0.2mag brighter than MZK/AHM. So the seeming trend from NRNA-SJAR-ELTA-AHM is not real. Now on 2456541 we have a rarity: a transformed dataset! GCO does a low-cadence, transformed, time series (since both B and V were used, we have an estimate of the color: B-V = 0.07 or so, still very blue). This nicely matches the next night's time series by AHM and MZK, so I'm more inclined to believe those two observers are close to the standard system. However, at the same time that GCO was observing, HAGA has a time series that is brighter by 0.1mag. Again, I don't believe this is likely to be transformation, and I'd like to look at HAGA's images. For fun, here is a screen shot of 2456540 from Zap, to show you the offsets between various observers. The green points are Johnson V, which is what I am concentrating on for now. Could you pick a comp star and check star for this effort? I think it may help with reducing the observed magnitude differences? Although I normally use an ensemble, for this target I only have 2 aavso comps in my 25' FOV. I use 80 for the comp and 98 as the check. I wonder what AHM uses? What do others use? I am using the same comp and check stars as you do. There is another nice overlap with WGR's data on UT 9/05 (JD 2456540.5). I am taking time series data as I write. After 1 AM I am running into some tree branches. It would be great if we could have another continuing "overlap session" (depending on your time schedule, of course). I have a question about transformation. In AIP chapter 10.4.4 in the second edition there is a brief discussion on "Do-what-you-can photometry." Would that be sufficient for the purposes of transforming nova observations, or is the more rigorous process called for here? Currently I'm uploading 3 files to the ftp (HAGA_file1.fts etc.) from the requested day. I stacked the images per 5 to reduce the scintillation. The exposures are 6s with a TEC-140 and a QSI-583 camera. The check star seems to be very consistent with the AAVSO value, so I have no idea how the nova could get a 0.1 mag difference. I just tried to do photometry also in Maximdl (I used MPO canopus AAVSO batch for the data which I uploaded) and I get the same values as from Canopus, so I have no idea if something is going wrong, but if so I would love to hear what's going on so that I can improve on that or reprocess if necessary. If you need more files, or the original raw files, or whatever please let me know. I'll look at these in a few hours. One quick question: a Baader V filter is a colored glass filter, similar to the Bessell prescription? Or is it a dielectric/interference filter like the current Astrodon filters?